If you’ve been following Rat Race Rebellion for a while, you’re probably familiar with Lionbridge. They’re a legitimate company that’s hired quite a few Rat Race Rebels as work from home employees and contractors. Right now, they’re looking for US Personalized Ads Evaluators and for Ads Assessors. Let’s dig in and take a look at each of these positions so you can determine which is best for you! Job Summary: A Personalized Ads Evaluator provides feedback and analysis on advertisements found in search engine results and provides ratings on their relevance to the search terms used. The Details: The company is looking for dynamic and creative people who have strong communication skills and use the Internet daily. Personalized Ads Evaluators log on to the online tool to select tasks to do on a self-directed schedule. Some of the task types will require both a desktop/laptop and a smartphone. Experience using Gmail as primary email, daily access to and use of a broadband internet connection to perform the work. Some task types require both a desktop/laptop and a smartphone. Only Android smartphones 4.1 or higher or IOS Smartphone (version 8 or higher), are acceptable. To Apply for the PERSONALIZED ADS EVALUATOR position, CLICK HERE. IMPORTANT: If you have any issues submitting your application or receiving a notification that your email address is already registered please Lionbridge directly @ [email protected] for assistance. Job Summary: As an Ads Assessor your ultimate goal will be to contribute towards making internet search more exciting, relevant and interesting for all end users in the US. You will play a part in improving the quality of one of the largest search engines in the world. The Details: The internet has now become the powerhouse of all information, everything you need to find or explore can be found on the internet, yet how can we be sure this information is entirely up to date or relevant? This is where you can contribute. Lionbridge is looking for creative thinkers who enjoy browsing the internet and would like to express their opinion on the quality and content of what is currently out there on the web. You will be provided with guidelines and scoring criteria on how best to evaluate an internet search result. You will have the flexibility and freedom to work from your own home, working your own hours. Tasks are available 24/7 with a minimum of 10 hours to a maximum of 20 available weekly. Payment will be based on completion of the agreed upon tasks or engagements within the specified time period. Software applications, e.g. Antivirus software, Adobe Flash Player, Acrobat Reader, Adobe Shockwave player, Microsoft Silverlight etc. Internet Explorer version 10 or higher is used on most tasks. 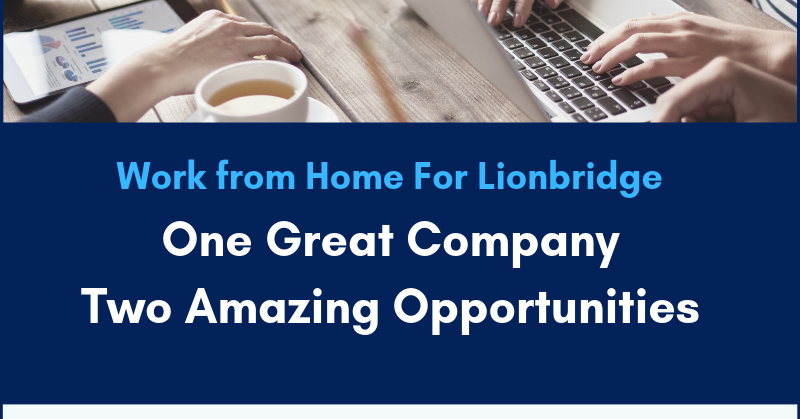 By the way, if you do a great job, Lionbridge may offer you the opportunity to contribute to other tasks and projects on a freelance basis! To Apply for the ADS ASSESSOR role, CLICK HERE. This entry was posted in Work at Home Jobs and tagged Lionbridge. Bookmark the permalink.